Enjoy a self-guided walk through Queens Park. Allow one and a half to two hours for a leisurely walk around the whole park. The centre provides information about the flora and fauna of the Ipswich region and it includes a café with a deck overlooking the Park – a great place to enjoy a break during your visit. The club was founded in 1902 and was allotted an area in Queens Park for a court. The club proved so popular that extra courts soon had to be laid out. The Club House was erected in 1933. The scientific name for Hoop Pine is Araucaria Cunninghamii. It was named in honour of the great explorer Allan Cunningham who first identified it at what we now call Pine Mountain. The memorial was erected to honour former businessman and politician John Macfarlane. The sculptor of the monument was Ernest Greenway, a great-nephew of the famous convict architect Francis Greenway. The road name honours the wife of the longest-serving mayor of the city James Finimore. As well as having a husband who was mayor, Merle’s father and grandfather were also mayors of Ipswich. The hillslope has been a popular place for large public gatherings such as Carols by Candlelight. There used to be a band rotunda here, one of two rotundas in the park. This is a modern structure, but its design is based on the old Band Rotunda which once stood on this hillslope. The Lookout gives a good view over the Ipswich CBD, and distant views to the mountain ranges. The Lookout is built on a ridge of white rock and the gate posts, steps, terraces and garden edges and kerbs in the Park are made of a white rock. This is limestone, the reason for Ipswich’s existence. 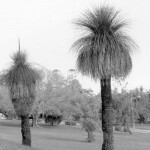 The tree with its distinctive crown just beside the Lookout is a Bunya Pine - Araucaria bidwillii - which was one of the first species planted in the park in the 1860s. The bush chapel, is an open-air chapel which is a popular place for weddings and baby-naming ceremonies. The Park provides a perfect background for wedding photographs. On the upper side of the bushhouse is the Ipswich Centenary Hibiscus. This was developed in honour of the 100th anniversary of Ipswich becoming a city. The glasshouse and greenhouse are reminders of the work of former park curators. One long-serving curator was Frederick Turley who was appointed in 1909. He personally planted the trees in many of the parks and avenues in Ipswich. The former residence of the park curators was built in 1938 and replaced an earlier residence. Note the clipped hedge in front which spells out the words “Queens Park'' and the bougainvilleas around the boundary of the house. The large tree on the same side as the Glasshouse & Bush house is a Hill’s Fig, a native Queensland tree with graceful, semi-weeping foliage. The tree is considered sacred in some religions because the Buddha was seated under one meditating when he received enlightenment. The Nerima Gardens are a Japanese-style landscaped area which was developed in consultation with Nerima, a sister-city of Ipswich. The gardens were designed to be “a place of peace and tranquillity, a place to meet nature and calm the spirit”. The unusual building was erected in 1936 as an incinerator for burning the city's garbage. It was designed by Walter Burley Griffin, the architect who, with his wife Marion Mahoney, designed the Australian capital city Canberra. The Rotunda was built in 1891 and was moved around the park a few times before being placed here. It is a reminder of the time when there were several bands in Ipswich and they were an important part of community life. Council has created this facility for you to enjoy and hopefully you will have a great experience and learn about the flora and fauna that exists around the City region also enjoy some other animals that you won’t see around Ipswich but are important to Australia. Ipswich City Council © Copyright 2019. All Rights Reserved.